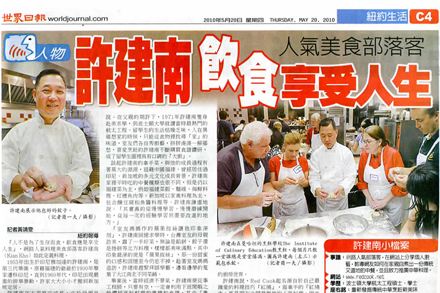 Last Thursday there was a two-inch red headline in the World Journal (世界日報) profiling me and my culinary endeavors. I was very excited by this coverage. 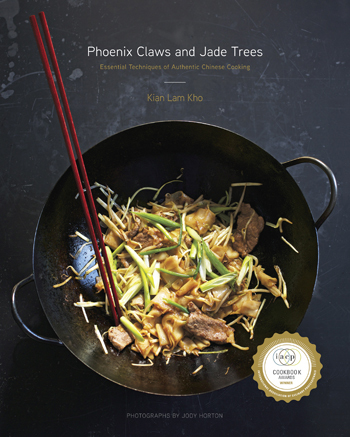 Through the Culinary Historian of New York I was invited this past March to participate in a panel discussion on “Chinese Food in America Today.” During the event I met a reporter from World Journal, the largest Chinese language newspaper in North America. A few weeks later this reporter emailed and wanted to write a profile about my cooking experience. So she interviewed me and a photographer took pictures of me during one of my cooking classes at the Institute of Culinary Education. I was feeling quite pleased by the size of the headline until I realized every other page of the paper contains a two inch red headline. If you can read Chinese here is the article, otherwise look at the pictures anyway. Manggy, you’re moving to NYC? How wonderful. Do write to tell me more.